Saturday and Sunday 30th November and 1st December - Carp Society winter show at Sandown Park - Official Southern Launch of Dave Mallin's new BIG CARP HUNTER series book, the first of a fantastic new series of books featuring the unsung big fish catchers of our time, Dave's catches are legendary and until now unpublished, this book will astound you! !, Dave will be on the stand all weekend. 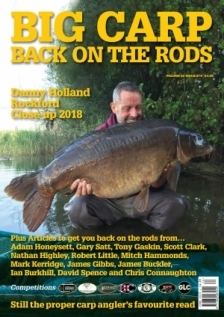 Rob will also be joined on the stand by John Harry, Mike Wilson , Albert Romp, Pete Springate, Dave Lane and Steve Briggs at various times over the weekend signing their BIG CARP LEGENDS series of books also Trevor Pritchard and Terry Dempsey at various times. Saturday and Sunday 7th and 8th December - Northern Angling Show at Event City Manchester - Official Northern Launch of Dave Mallin's new BIG CARP HUNTER series book, with Dave on the stand at various times over the weekend. Saturday and Sunday 18th and 19th January 2014 - British Carp and Angling Show - at the Norfolk Show Ground, Norwich Norfolk. Rob Maylin with many other famous carpers and all the latest books. Saturday and Sunday 25th and 26th January 2014 - the Brentwood Show – Official Launch of Nick Helleur's new BIG CARP HUNTER series book, the second book in this exciting new series. Nick has been a prolific catcher both here and all over the world for almost three decades and has never written a book! !...this one will take your breath away. A massive book with superb photography, certain to be book of the year 2014. Nick will be on the stand to sign copies with guest appearances by several other angling authors. Saturday and Sunday 22nd and 23rd February 2014 - The Big One at Farnborough airport - Home turf for Bountyhunter Publications expect a big turn out of special guests and a massive attendance of people...... They don't call it the BIG ONE for nothing!! Saturday and Sunday 15th and 16th March 2014 - Carpin' On - 5 Lakes, Tiptree Essex - All the latest books with several guest writers on the stand.